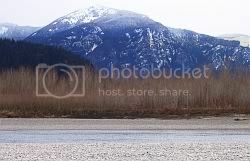 Yesterday, Sunday, my wife and I drove to the Fraser River near Chilliwack, British Columbia to scout that portion of the river for future fishing trips. Trough the grapevine we heard that this area holds lots of fish, among them salmon for which BC is world famous, and cutthroat trout. The weather was cold, overcast and at times drizzly rain, this did not hinder the natural beauty of the area. Yes, I am in love with British Columbia and will readily admit that after all my international travels I have not seen a more beautiful place yet. We walked along the riverbank searching the water surface with binoculars for changes in the current giving an indication of the structure below the water surface. 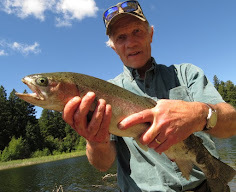 I found plenty of good and promising features that look promissing to hold trout. Lots of submerged trees, big rocks and other underwater features that trout like. I definitely will be back there on a warmer day when the cutthroats rise, with my fishing rod and an assortment of lures. It is said that 2007 is a good pink salmon year here in BC. 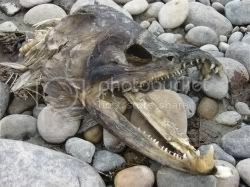 This became quickly obvious when we walked the shoreline of the Fraser River, which was littered with thousands of salmon skulls and skeletons the air still saturated with the smell of rotting fish. It's a cruel joke of nature that these fish have to swim thousands of miles to their birthplace, encountering all sorts of life threatening encounters along the way, including the abundant numbers of hungry grizzly bears we have here in BC, until they reach the exact spot where they where born to give life to a new generation of salmon and then die. With so many rivers and lakes, full of fish in all sizes and shapes, British Columbia is not only the ideal place for fishers but also the bald eagle. Indeed BC is the North American capitol of bald eagles. Seeing on any given day five to ten of these majestic birds sitting high in the trees or gliding seemingly weightless trough the air is not uncommon here in the Lower Mainland, even in the big cities such as Vancouver. All in all we have had a very good weekend that we spent out in the great outdoors. My wife, an accomplished photographer found many pleasing subject to photograph and I found a new promising fishing place that I definitely will visit again. I am looking already forward to the coming weekend when the largest hunting and fishing show here in BC opens the doors for three days over the weekend. Looks like a beautiful spot. That is also a great picture of an eagle. I still remember the time I saw my first bald eagle in the wild. It was an awesome experience. The Frazer river near Chilliwack reminds me great souvenirs. I've joined the Canadian Forces in 1989 and I completed by basic officer training plan at CFB Chilliwack. It was the first time that I was leaving my family but I do remember that first view of the Canadian Rockies and the Frazer river. Lucky you to be so close to this nice river. Thank you all, you have the honor of the first guest posters on BC Fishing Blog. Kristine – I don’t what to appear to be bragging, but everywhere you go here is beautiful. I fell in love with this province the day I arrived and after all these years I am still awestruck and in love. Bald Eagles are such majestic birds. 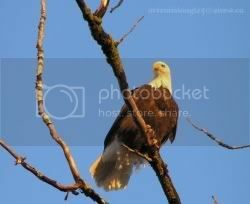 BC has North America’s largest eagle population. In fact they are so plentiful here that nobody turns their heads anymore if the see an eagle. Heidi and I never tire of seeing these magnificent birds in flight or simply sitting on a tree near a river watching the water surface for a tasty meal. Marian – Thanks for the kind words I appreciate it very much. Mike – Thanks for considering me lucky, I feel the same way. When you were stationed in Chilliwack then perhaps you also know, or have heard of, the Vedder River. The Vedder is a well known steelhead fishing river, the hotspots are all near Chilliwack. The Frazer River on the other hand is known for our famous sturgeon fishery. Should you ever come our way again let me know and I will show you some of the best spots to fish.